Anyway, we mention this because last night, after the Rangers 4-3 win over Pittsburgh, Tortorella was asked the following question: “How close to an elite team do you think you’ve got now after this win?” Tortorella wanted no part of that discussion: “Wrong question. We’ve still got a ways to go. We’re just going to continue to work at our game.” And indeed, perhaps it’s too early in the season to declare with certainty that the Rangers are truly one of the Eastern Conference’s elite teams, and perhaps it would do Tortorella no good to answer differently than he did. But you know what? It’s time to at least start asking the question. Last night’s win was the Rangers’ tenth in twelve games, and their seventh straight on home ice. And though the standings tell you that the Rangers are fourth in the East with 29 points, it’s worth remembering that they’ve played fewer games than any team in the conference. (The first-place Penguins have three more points, but have played four more games.) In fact, the Rangers have more points per game played than any team in the league. The Rangers have been getting contributions from a number of people over the past couple of weeks — even call-ups Carl Hagelin and John Mitchell have looked good since joining the team — but last night, the big-money forwards stood out. Marian Gaborik, who’s been skating so well this year, was the best player on the ice, and Brad Richards had three points during a second-period offensive explosion that gave the Rangers a 4-1 lead. The Rangers’ best were better than the Penguins’ best last night, and that’s no small feat against a team as talented as the Pens. Pittsburgh, as you’d expect, still made a game of it despite the three-goal deficit, scoring late in the second and then early in the third to pull within one. 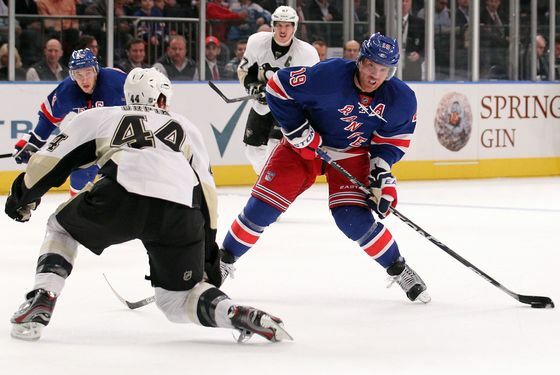 But, in part thanks to a Penguins’ third-period parade to the penalty box, the Rangers held on. We’re trying our best to keep our expectations in check, as we promised ourselves we’d do this summer. Right now, this team is playing some really good hockey, but we’re aware they’ll eventually cool off, like any team would. Tortorella’s right: The Rangers have some things they can work on. But the possibility of this team getting even better still is pretty exciting.